Bill Bryson’s witty travel jaunt Down Under had filled my head with Australia-infused wanderlust from the moment I read it, and driving up the dusty red road towards the Hamelin Pool Telegraph Station and Campground we were both filled with anticipation for the ancient wonders and quirky stories that lay ahead. In his book, Bill had gone into hilarious, and fine detail about the telegraph station and the strange beings that can be found in the bay. For us, it certainly lived up to the hype, a collection of old wooden buildings and lots of old signs: it looked frozen in time. We hadn’t chosen to stop here because of Bill Bryson though, Chris was already well aware of, and super excited to see, the main draw at Hamelin Pool: the stromatolites. 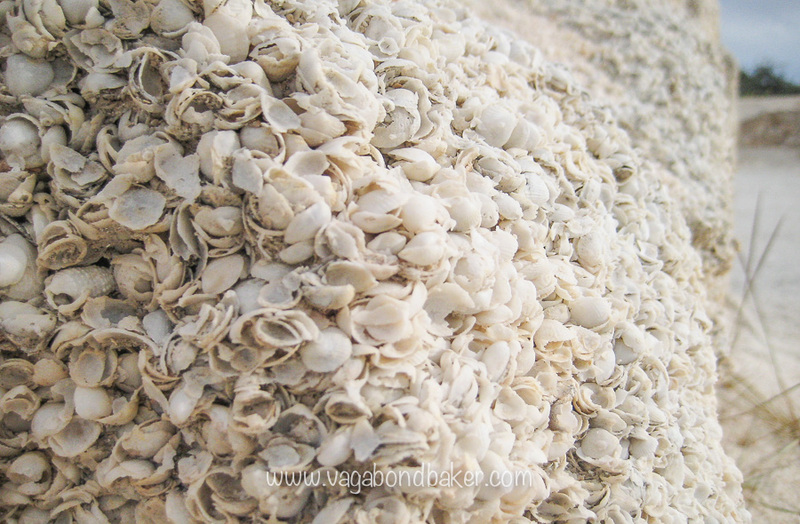 After pitching our little red tent in the shade of a tree we took a stroll out to the pool, the trail taking us through a shell brick quarry where a beach of tiny white shells had solidified over millennia and in the past blocks had been cut from it for building. It is an extraordinary thing to see, blindingly white cubes of shell: robust fragility. A boardwalk took us out over the water, information boards had given us the lowdown on what we were about to see. 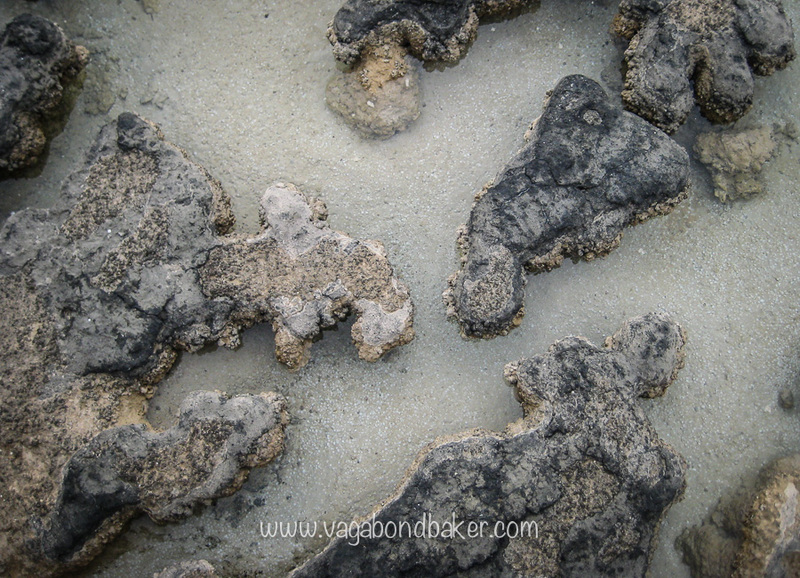 The stromatolites were exposed in the shallow tide of the marine reserve. You see, these small rock formations gathered in the bay are alive, not only that, they are direct descendants of the organisms that gave life to this glorious planet we live on! Stromatolites were the very first photosynthetic life on earth, converting sunlight to energy, releasing the oxygen that gave our planet the atmosphere for life to blossom: we owe them our lives! 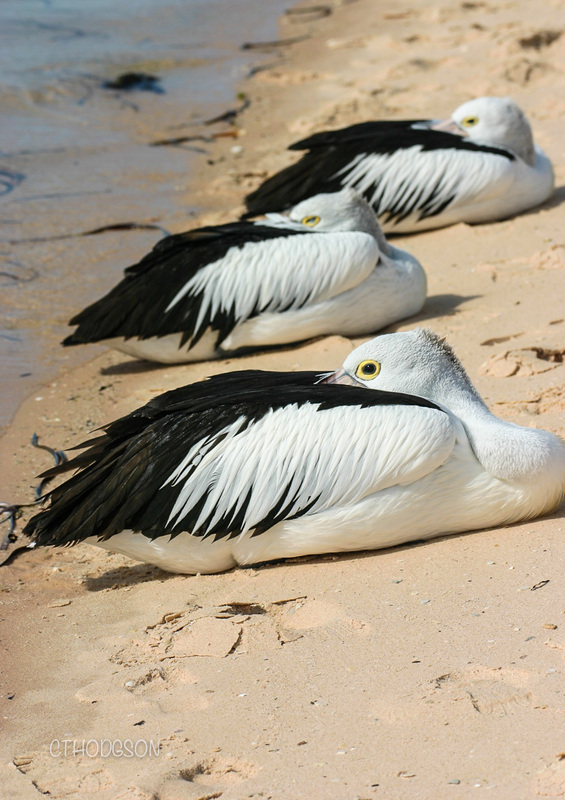 They are incredible, and they still exist today in rare locations like Hamelin Pool, in Shark Bay, Western Australia. Remarkably, for such a hugely important, UNESCO-recognised, site, there is no circus, it is as down to earth as you could possibly imagine: just an old post office, a tea room and a board walk, wonderful! And yes, you can get a Devonshire Tea, scones and all! 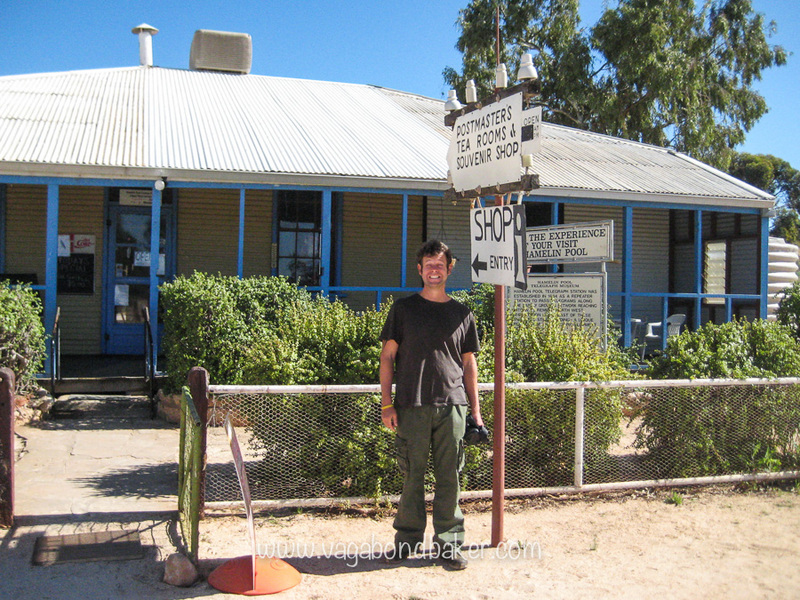 We had arrived at the Hamelin Pool Telegraph Station two days after leaving Exmouth and the incredible Cape Range National Park, continuing our road trip from Broome to Melbourne. 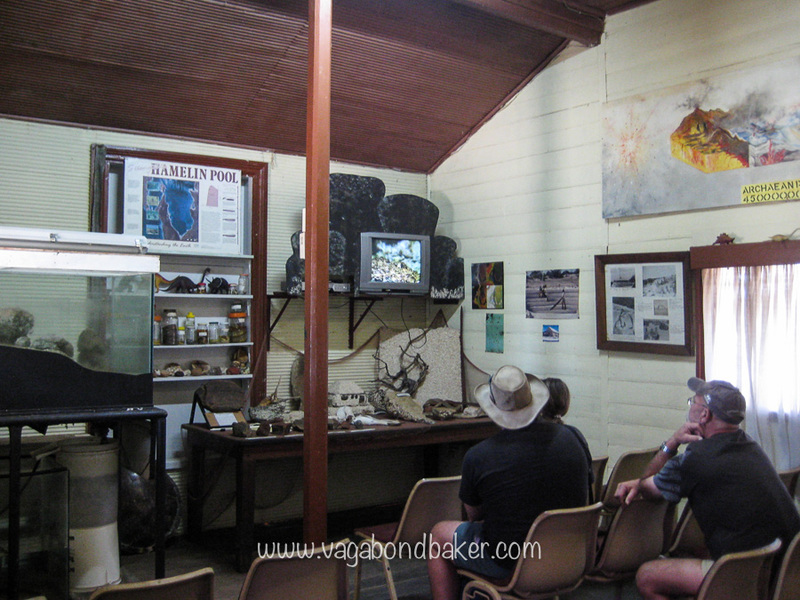 The journey had taken us via Coral Bay, a small touristy town on the coast just south of the Cape Range Peninsula. 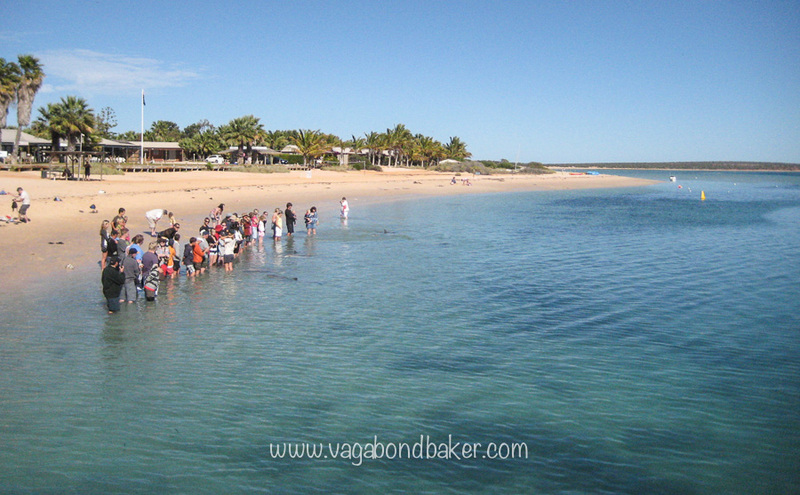 The bay gives more access to the Ningaloo Reef and all its coral wonders. After the fantastic week camping and snorkeling in the Cape Range National Park we only paused for a few hours in Coral Bay before heading south, camping at a road house further along, inland. 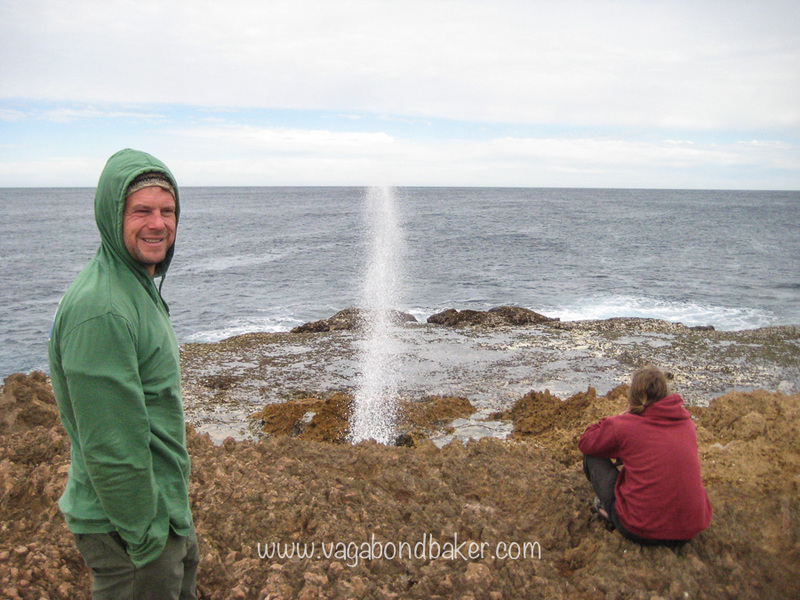 Early the following morning we set off to visit the Carnarvon Blowholes, a 50km drive back to the coast from the main road. 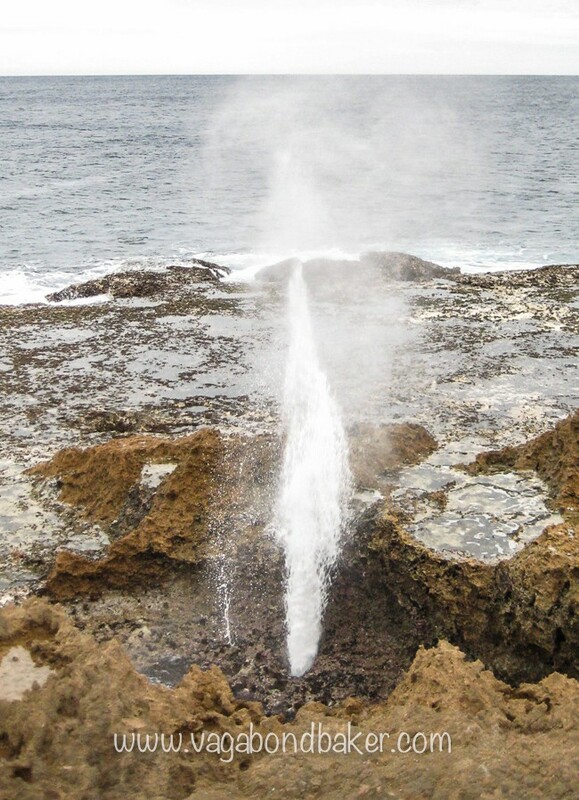 The day was a little wild making the scene even more dramatic, the rough ocean crashed onto the rocky shore forcing the sea water through narrow holes with a whistle and a geyser-like jet. 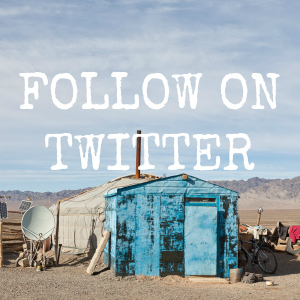 Who should we meet at the blowholes but Lotti and Hike, and their adventurous green VW bus, they had camped the night here. We were hoping to stay this night, to chill and do some snorkelling in the coral-filled lagoon to the south of the blowholes but the weather wasn’t on our side and we decided to move on and head to Shark Bay, if for no other reason than the name Shark Bay sounds awesome! 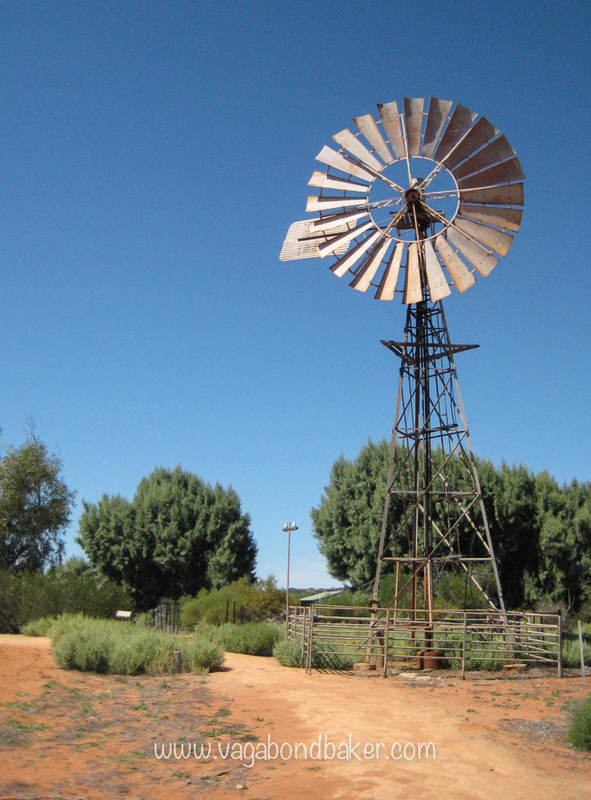 We had arrived at Hamelin Pool in the mid afternoon, after stopping in Carnarvon for supplies. 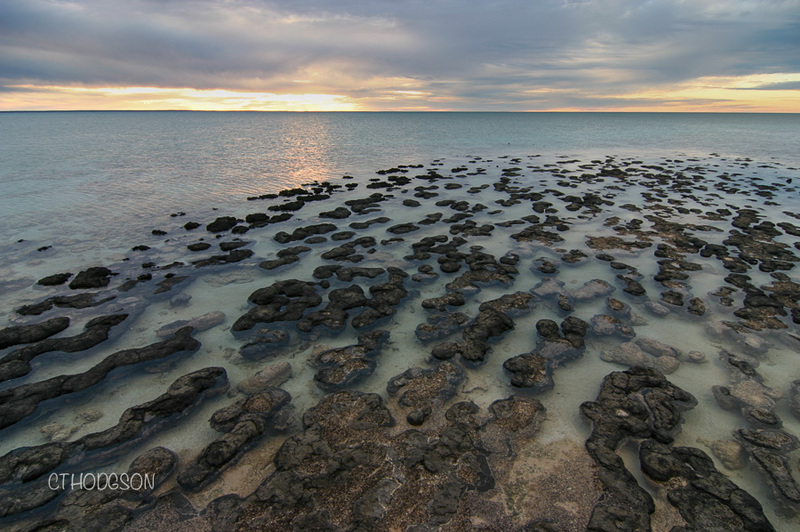 From the stromatolites and the telegraph station we drove north up the Peron Peninsula towards Denham and Monkey Mia. 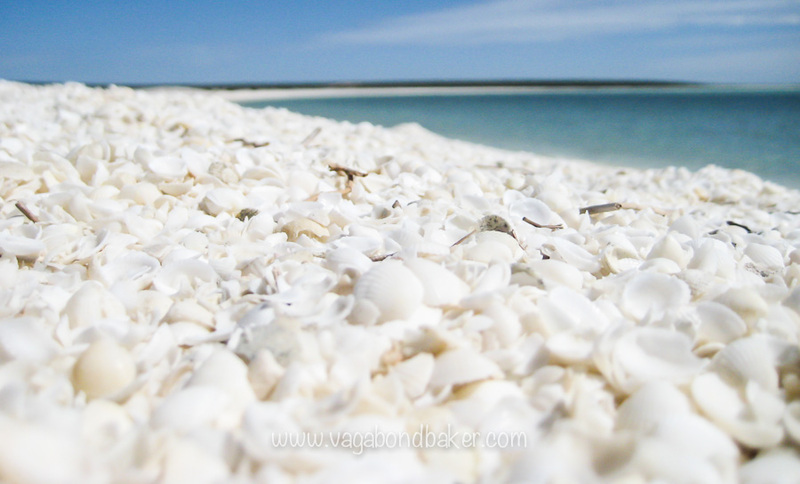 En route I discovered the reason for the shell quarry down at Hamelin Pool, a little up the coast was a beach made completely from the same tiny white shells. 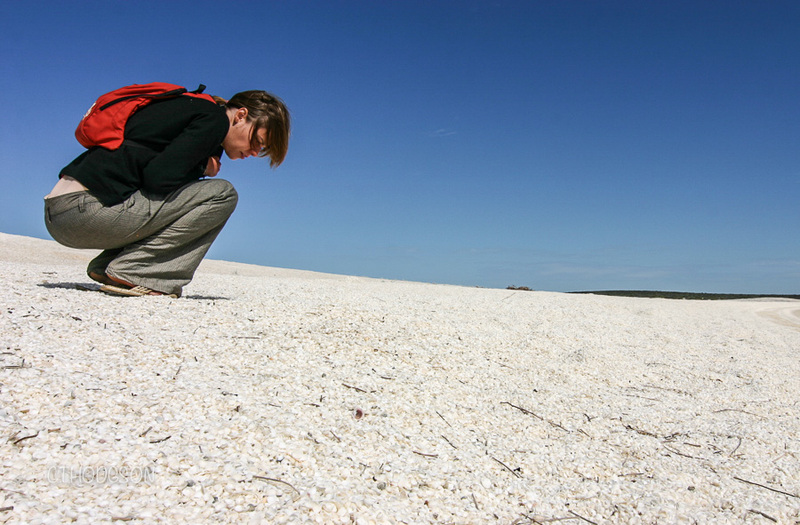 A sign explained that the super-salinity of Shark Bay only suits certain creatures, the main one being a tiny cockle, it was their little shells that had built up over time to form beaches in the sheltered bay. I was expecting Monkey Mia to be very touristy, and expensive to camp but it wasn’t too bad at all. The rest of the afternoon was spent lazing on the narrow beach, reading. Some fisherman came over to the nearby tables to gut fish and the five handsome pelicans standing at the water’s edge surrounded the men, waiting patiently for any discards. 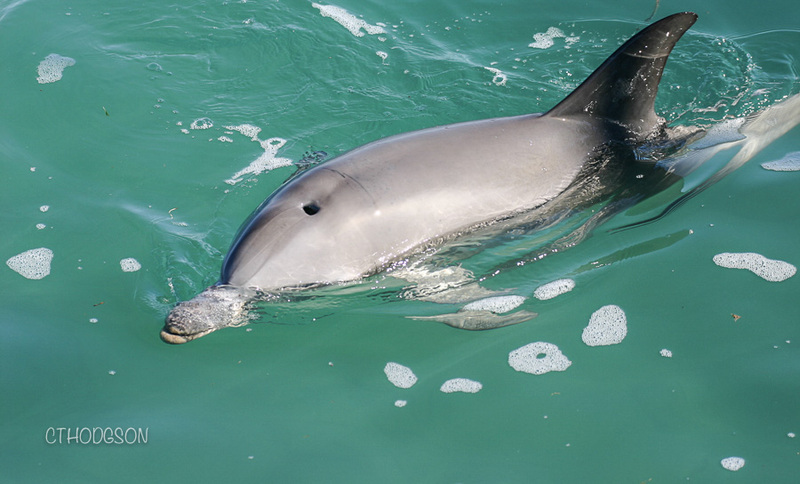 They weren’t the only wildlife hoping for a treat either, while we watched one of Monkey Mia’s famed visitors appeared in the shallows: it was a dolphin! 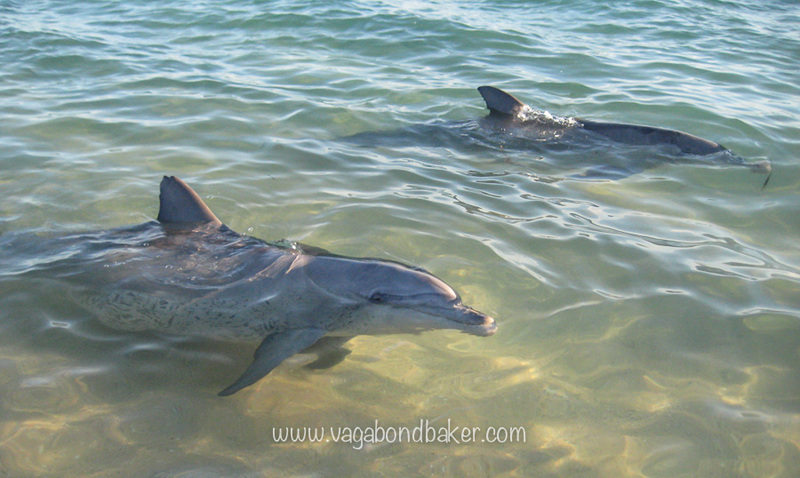 The dolphins began to come to the beach back in the 60’s, after being gifted fish by one of the fisherwomen, first from the boat, then from the beach. The dolphins soon learnt of this easy feed and got lazy, regularly hanging about for effortless fish. This attracted tourists and in the end it had to be regulated to prevent the dolphins from relying entirely on this food source. Today the dolphins are strictly given a quarter of their daily food requirement, forcing them to hunt naturally for the rest. Their familiarity and reliable regularity has made them excellent research subjects and a lot of what is known about dolphins comes from these visitors. It was extraordinary to see a wild dolphin so near, it was in such shallow water it was barely covered by the lapping ocean. 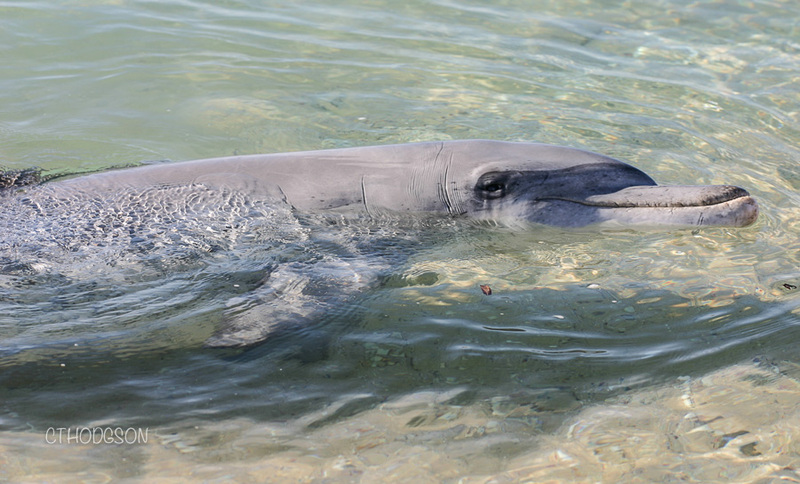 It is illegal to feed the dolphins so this one’s begging went unsatisfied and it swam off. Early the next morning we headed back down to the beach for the first of three feeding sessions. A group of tourists gathered on the beach around the park rangers in the water, the dolphins soon appeared. They inquisitively gave us the eye, they knew how it all worked! A ranger gave us a talk, explaining the history, the dolphins and their diet. Each dolphin gets four fish, from individually named buckets, fed by hand from volunteers from the crowd: beggars don’t get picked! Randomly, Chris got picked, I couldn’t believe it! He got to feed a wild dolphin, I’m still jealous now! That afternoon we drove up the tip of the peninsula to the Francois Peron National Park, to the homestead as that was the only route in the park that was suitable for regular cars. 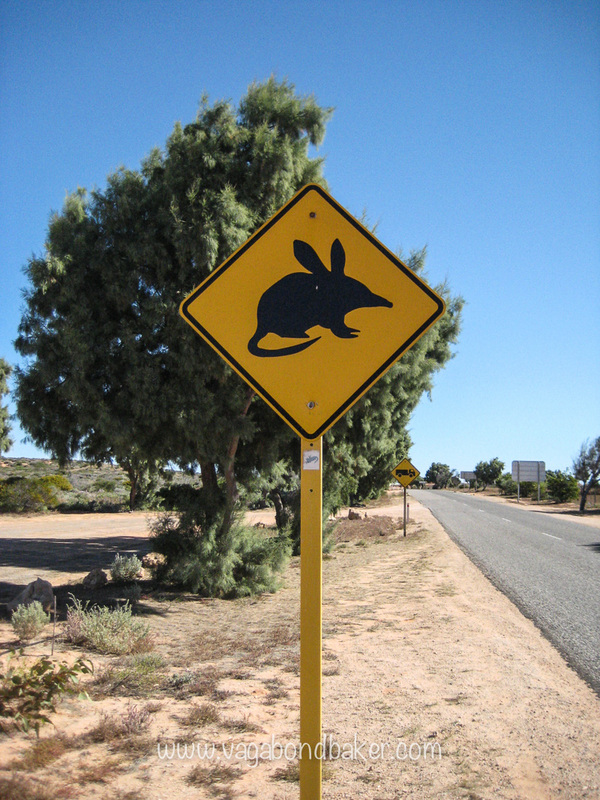 The homestead had an interesting, unmanned visitor centre with stuffed animals of the species found in the park including the strange bilbi: a large rodent with huge ears. Around the back of the homestead is a 44ºC bore water hot tub so we got our cozzies on and went to have a look. The homestead was a shearing station, there are windmills and barns, it is all very rustic, and so was the hot tub: it was grim! The water was indeed nice and warm, but it was brown. Had it been naturally brown and grim that would have been fine but the water had a greasy look and there was plenty of hair floating on the murky surface, like I said: grim! I didn’t stay in long at all – I can’t actually believe now that I actually got in it –, a cold shower rinsed the ‘grim’ off and we dressed for a hike into the park. The red sand was criss-crossed with hundreds of different undisturbed prints: tiny lizards, big lizards, small wallabies, snakes and various birds, they all left their footprints, it was fascinating and revealing. 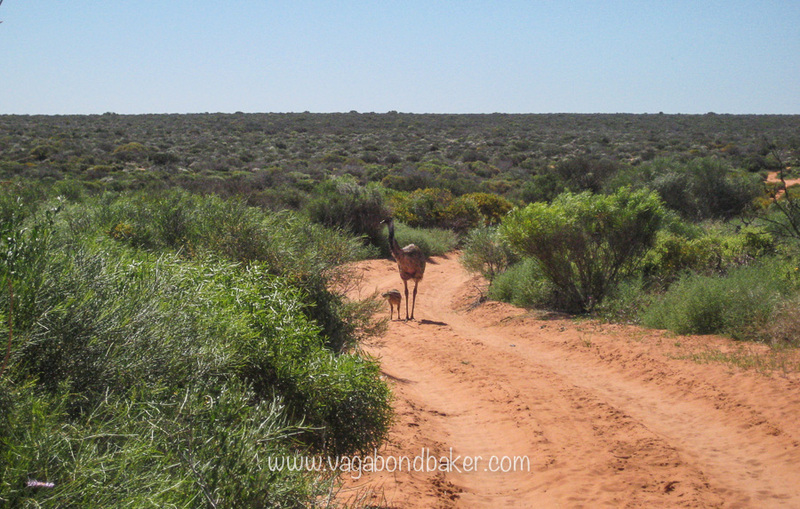 As the trail returned to the homestead we came across an emu with five stripy chicks, her size was a little intimidating so we stood still and waited for her to walk off the path. After she’d cleared a good distance we carefully began to walk, then she suddenly stopped and turned at us, and stamped her foot menacingly! I was terrified! Emus are so big and their feet look frightening, we edged back and she stalked off. My heart was pounding, my palms were sweating with fear! On the drive back down the peninsula we took a break at Eagle Bluff and did the boardwalk along the cliff top, overlooking a shallow bay far below. 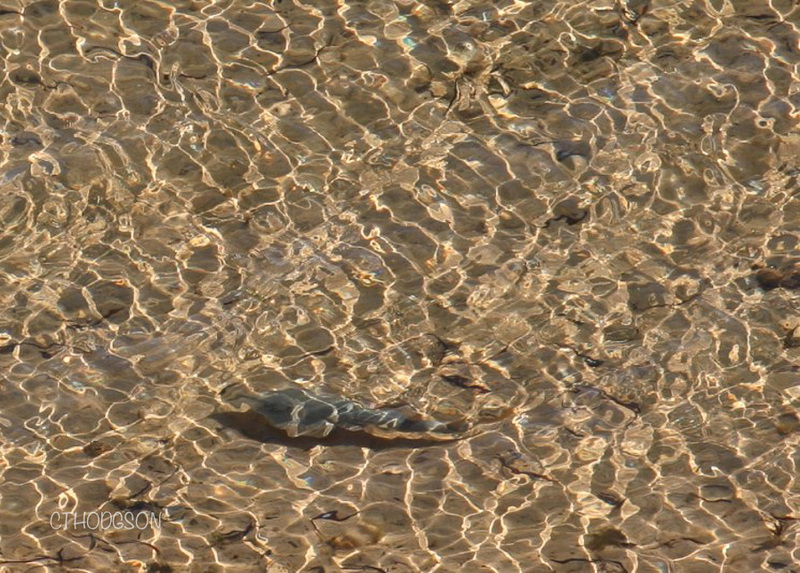 Peering down into the waters we spotted two giant shovel-nosed rays with their very distinct shape. 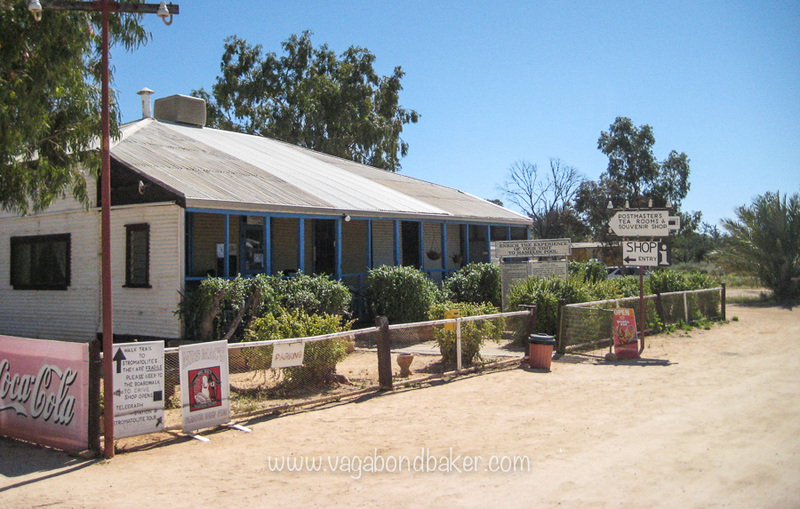 That afternoon we returned to the Hamelin Pool Telegraph Station Campsite, and had Devonshire Tea. On our first stay we hadn’t checked out the Old Telegraph Station museum, so we booked ourselves onto the tour of it the next morning. This was exactly how Bill Bryson had described, the rooms smelt old and historic. Our guide, Alan, showed us a DVD explaining what stromatolites are, it was informative. I learnt that the stromatolites are a form of cyanobacteria, these cylindrical organisms have a slimy membrane that fine shell grit sticks to. The slime is a by-product of photosynthesis, as is oxygen, when darkness falls the organisms stop producing the slime and the grit becomes fused, creating a hard layer.The stromatolites grow half a millimetre a year and if you look patiently you can sometimes see them ‘breathing’, excreting bubbles of oxygen into the water. The museum has a pet stromatolite, a live specimen in a tank (you can see it on the left of the photo), unfortunately some floods earlier in the year had cut off it’s water supply from the bay and it wasn’t currently ‘breathing’. If you’ve visited here recently, I’d love to know if it’s still alive and well! 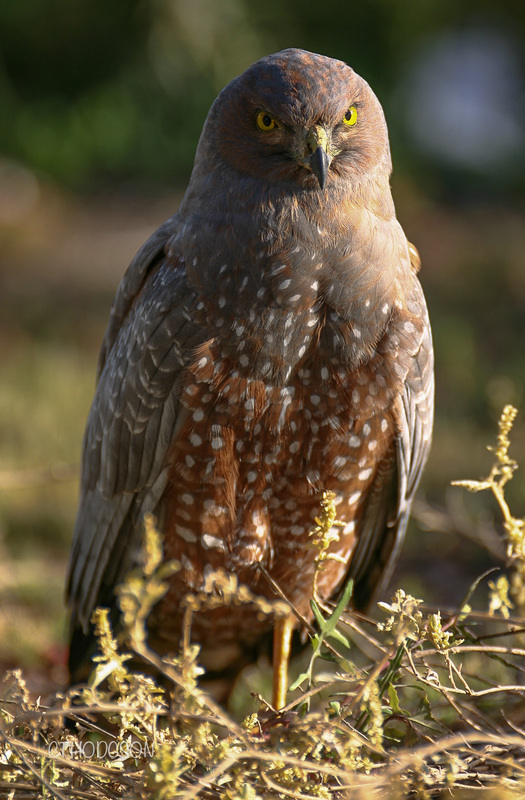 This stunning spotted harrier hung around the campsite at Hamelin Pool Telegraph Station the whole time we were there. This photo was taken from our tent, the harrier had killed something and was happily feasting on it just a few metres away from us. What a stunning bird! We left that afternoon, driving south towards Kalbarri. 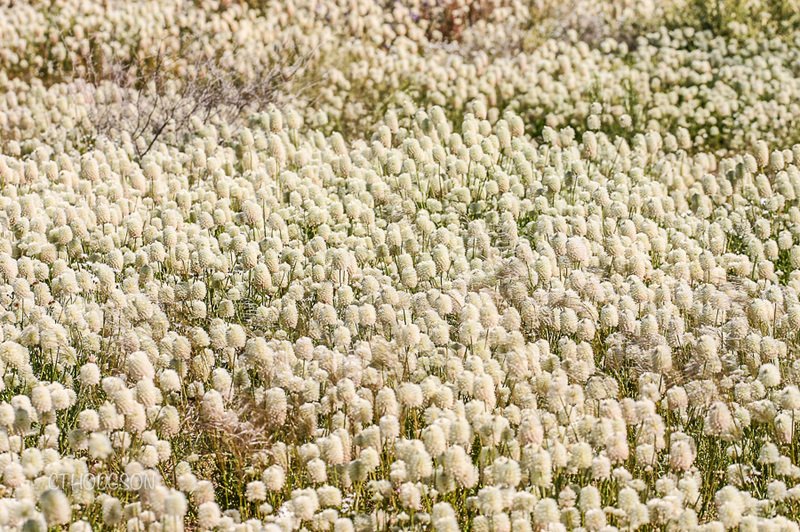 I really liked the Peron Peninsula, it smelt lovely, the wildflowers blooming across the peninsula scented the air and it wafted into the car as we drove along. 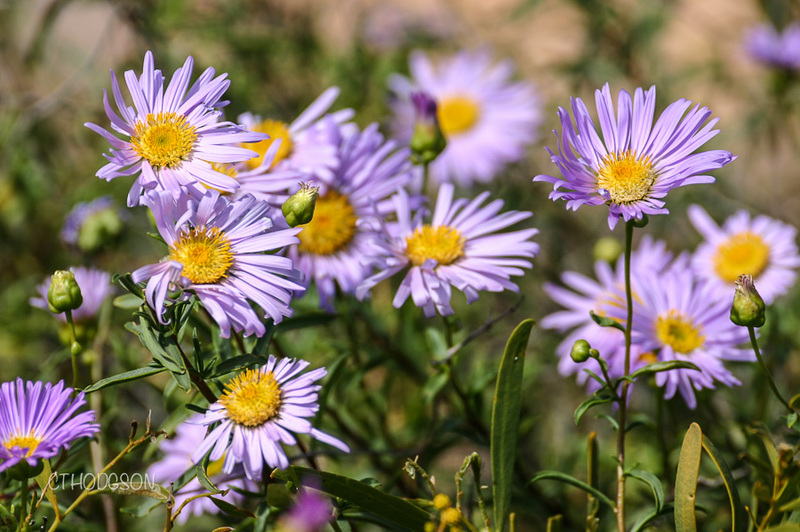 I loved how Australia had wonderful surprises as we passed through it, these abundant wildflowers were both unexpected and beautiful. I couldn’t wait to see what else we were going to discover! The next instalment sees the Kalbarri National Park, we get our passports stamped in and out of the Hutt River Province by the Princess (!) and we get pulled over by the police! We’d driven another 1000km from Exmouth (A) to the Francois Peron National Park (G) and down to Hamelin Pool (H), via Coral Bay (B) and the Blowholes (D). Part 4 Kalbarri to Perth Meeting a Princess and Chad gets pulled over by the police. Part 5 Fremantle to Albany Heading into the forests and facing my fear of heights. 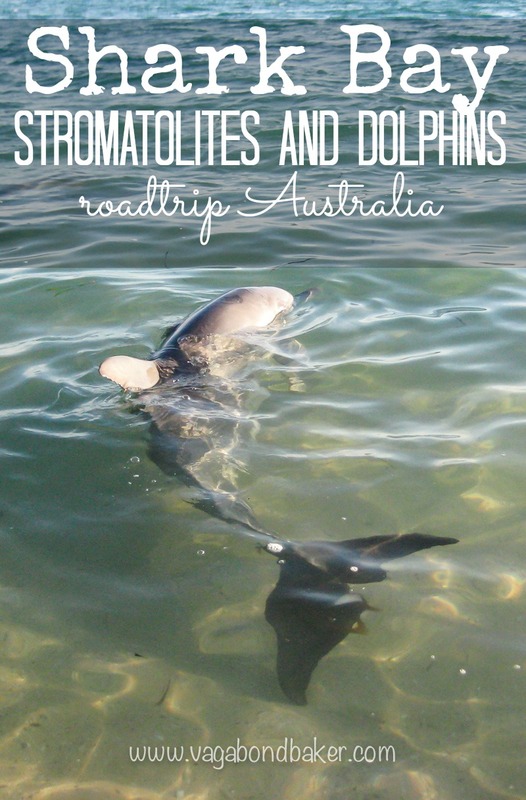 Part 6 Crossing the Nullarbor Epic crossing into South Australia, and lots of whales! 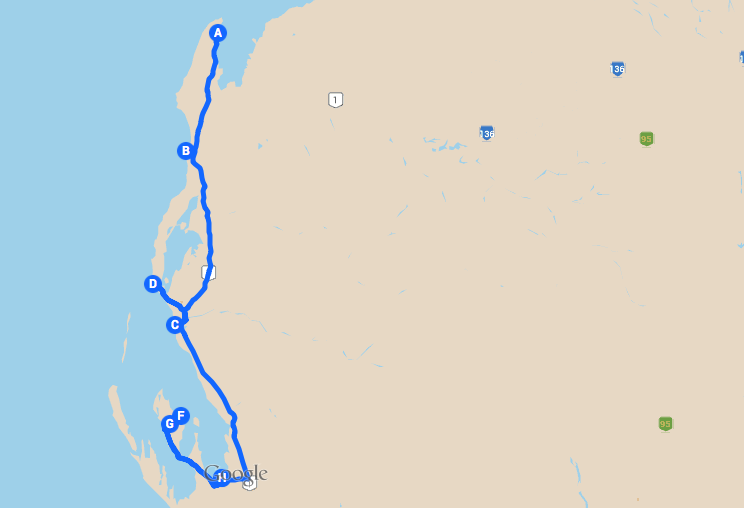 Part 7 Ceduna to Melbourne The last 2ooo kilometres via the Great Ocean Road. Part 1 Broome to Exmouth Halfway around Australia, in this car? The beginning of the adventure! 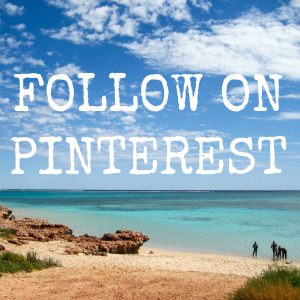 Part 2 Cape Range National Park: Snorkelicious Australia! Snorkelling with turtles in the Ningaloo Reef! 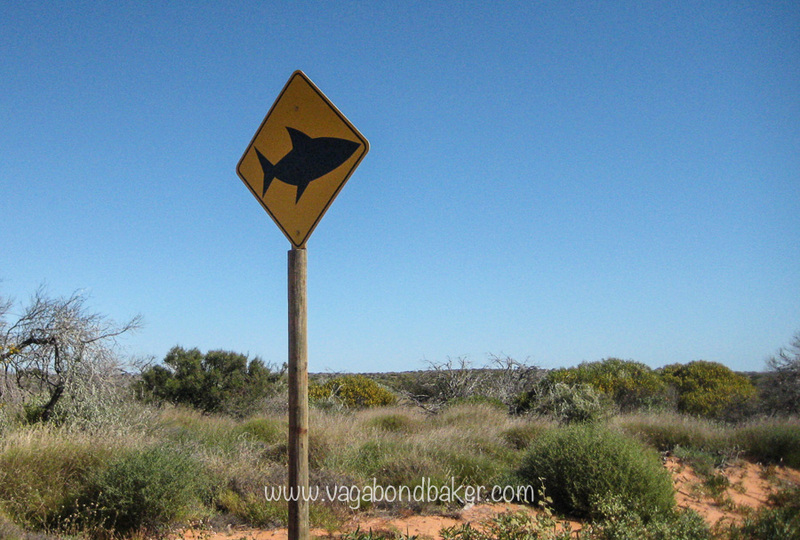 Have you been to Shark Bay? Thanks Dave! It was really special, and yes, that emu freaked me out! I’m so sorry if I haven’t replied to any other comments from you, I found this in my spam, not sure why you’re filtering into there! 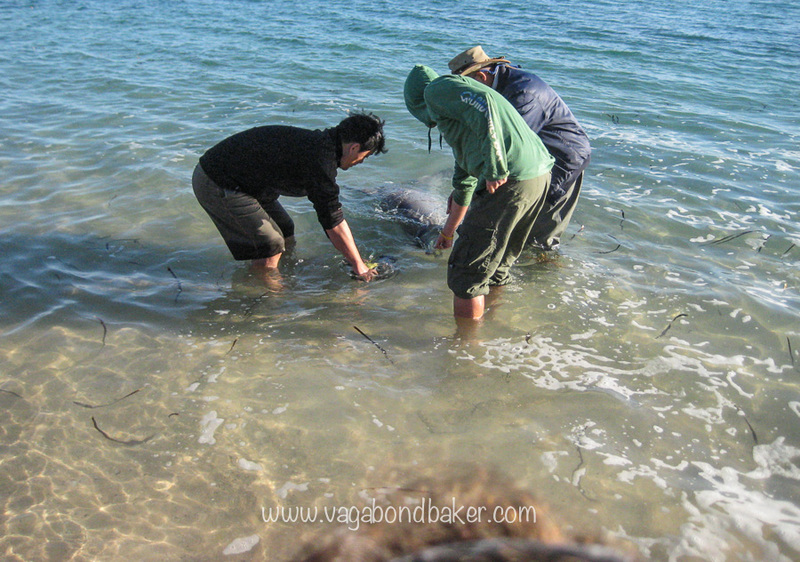 How awesome to be able to feed a wild dolphin !! I would love to do that !!! The beach look gorgeous. I was so surprised Chris got chosen, I thought they would only pick the kids! The West Coast of Australia should be on everyone’s bucket list, it is incredible! The Bamboo Train. 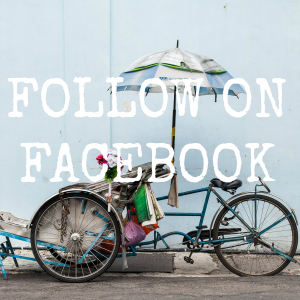 Battambang and its quirky railway! Midsummer in Shetland, diary for week three. Ticking Off My #1 James Bond Location! Oh Rauma, You Must Be So Pretty In Summer! Fremantle to Albany. Road Trip Australia! © 2018 Rachel A Davis. All rights reserved. 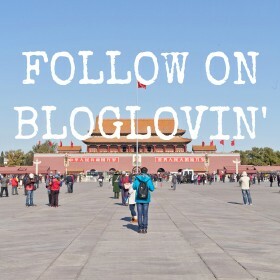 All the photographs on this blog were taken by me and belong to me unless otherwise stated. 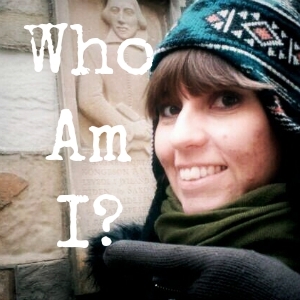 Images must not be downloaded, reproduced or manipulated without prior written permission from Rachel A Davis. Be nice.